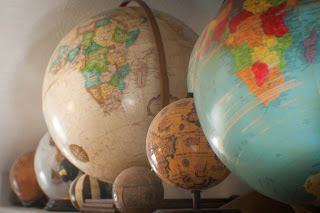 I started collecting these globes about a year ago. It didn't take long to work up a good collection, and I love how they look displayed together on my planter shelf. Most of them came from yard sales or thrift stores. I'll never forget that summer day when I found the big globe in the center. I pulled up the the yard sale, and spotted it before I even got out of my car. It was beautiful, and only $7! Did I mention how much I love yard sales? I was so excited, that by the time I was leaving, I could not find where I had placed my keys. It took several solid minuets of searching to find I had placed them in some obscure purse pocket. It was a good day. I'm always on the look out to find globes that aren't just standard size, but to find one that was much bigger was a real treat! The blue globe on the far right was one that I altered. I had two blue ones that were so similar, I decided to paint all of the pink sections on one of them red, and do a brown glaze over the whole thing. This gives it an aged look. I love the result. The small black one was also altered. In fact, it was just a cheap plastic pencil sharpener (the sharpener is in the base). Again, I just painted all the parts to make it the way I wanted it to be. It went from looking cheap, to looking like something really special. The two on the right are the ones I altered by painting. The brown one was a lamp. the main pole to give it the axis. The paint jobs aren't perfect, but it does the job, because I have these up high on my planter shelf, where nobody will notice the imperfections. My other trick is (since a few of these have dents or rips on them), I just turn those parts toward the back wall, and again, nobody even knows. I also used blocks of wood to set some of them on, to stagger the heights, adding visual interest. It's fun to have something you're on the look out for when your going to yard sales. 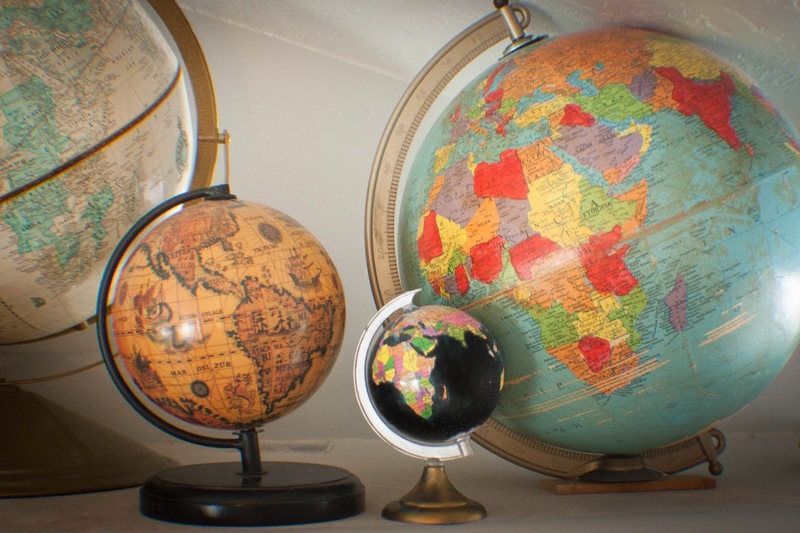 I have several things, but globes are one of the most fun. It's fun to find different sizes and styles, but even if I find repeats, I know I can just alter them to my own liking. Katie (5) shares my love for yard sales. We were at one and she found a caboodle that she just had to have. I tried to talk her out of it. "Katie, you really don't need that". She turns to me and says, "Mom, you have a globe collection, and I have a caboodle collection". Needless to say, she came home with the caboodle. I LOVE your globes!!!! I have a blue globe that looks nice but would much better with red earth and a glaze...so basically I want to copy you :) How did you do the red earth? What kind of paint? I've done my fair share of staining before but have never glazed. How did you do the glaze? What kind do you use? I really want to make it over but am scared to. Great questions! I usually order all of my paints online at http://www.dickblick.com/. For my red paint, I used Golden fluid acrylic's Naphthol Red Medium. But that's just what I had on hand, it's more pricey and any red you like should work. I mixed the red with some glaze (but not as much glaze as I mixed for the brown), so the color wouldn't be too opaque. For the glaze, I used Liquitex Acrylic Glazing Medium. But you could also use any water based varnish in place of the glaze. You could even just use water, but I like glaze or varnish better, because the water tends to be too thin and runny. I would suggest playing around with the glaze-to-paint ratio, and practicing on something else first (maybe a page from a magazine). For the red parts, I used smaller brushes. For the brown glaze on the whole thing, I used a very large, soft brush. I even used a rag, until I got the right effect I was looking for. Good luck! Hmmm...maybe you should show me how or help me ;) In trade I could show you how to...uh....you are amazing!